Our Personal Stylist e-learning Course has been designed to enable you to learn all the skills and knowledge that you need to become an outstanding Personal Stylist or Personal Shopper. This is the most advanced Course of its kind and we constantly update it to ensure you are provided with the best possible learning experience. Colour Me Beautiful offer professional, leading edge, high quality training, wherever you are in the world. We are the international leaders in training Personal Stylists and we can bring you the best e-learning experience available anywhere today. The course is designed for trainees worldwide and should take about 40 hours of concentrated study. Although the course is in English, it is also designed for candidates whose first language may not be English. There are no pre-requisites for signing up for this course, we will take you through all the theory and practical sessions; building your knowledge and confidence in the subjects. So, whether you are looking for a career change or adding these services to an existing business, it will work for you. Throughout this Personal Stylist E-learning course we will give you the technical knowledge you need to become a personal stylist as well as encourage you to develop your practical styling talents on future clients. We believe this is truly the only way to learn and develop your skills. **The course must be completed within a 6 month period. 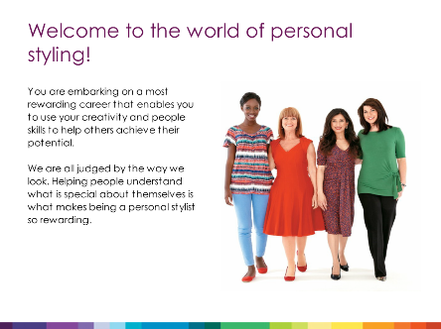 Click on the image below for a quick VIDEO TOUR of our E-learning Personal Stylist course. Please note that you can see the transcript of the audio if you click on 'Transcript' at the top left hand side of the video. The course includes interactive tests, questions, case studies and a final assignment. You can download all relevant material. You will have the option of your own personal tutor, one of our leading trainers, to help and guide you via email/skype. You will also receive one of each of our dominant colour wallets (6 in total) plus our latest books, Colour Me Beautiful and the Make-up Manual (published by Hamlyn-Octopus), so you can start working with clients as soon as you qualify. “Considering training as an image consultant, I investigated a number of companies to find the best option. What my research revealed was that Colour Me Beautiful clearly stood out above all the others as the best company to train with. They definitely walk their talk and once I began my training it was clear that they had an integrity and credibility that confirmed I'd made a wise choice and I knew that I was going to get the best training to be a successful image consultant. The content of the training is good on so many levels and every day I got confirmation that I had chosen the very best company to train with. "I had been for a colour analysis with a Colour Me Beautiful consultant and was very impressed. On reviewing the Colour Me Beautifulwebsite, I was pleased to see that there was an e-learning version of the Personal Stylist course. This suited me perfectly as I work full-time. I have found the course to be both fun to complete and easy to follow. The documentation is excellent, the videos are very clear and helpful and if I had any queries or concerns, there was always enthusiastic support at the end of the phone or an email which was also extremely helpful. I would absolutely recommend doing this course. I have thoroughly enjoyed it and I am loving putting what I have learned into practice. I have since gone on to become fully qualified as a Colour Me Beautiful consultant by attending the Colour and Make-up training in London." -- Rosie, United Kingdom. "My opinion: value for money! I have a boutique in Belgium and after following the course, I have started immediately with my Colour Studio, a combination of selling clothes and giving colour consultations. You have to build up your customer base and it will take a little time, but when people trust you and believe you, they send other clients to you and your business will grow. CMB offers you a lot of support. If you have any concerns, you can always contact your mentors or your colleagues and they organise seminars to keep you up-to-date. I have been to one last week and I felt like I was family. In all honesty, CMB is without doubt a leading company, particularly when I compare it to other similar companies in my country and abroad. If you want to follow the course, don't hesitate! The course is a high standard, the support is quality and the rest you have to do yourself. They give you the self-confidence on the course and you have to pass on this confidence to your clients; it will work." This course covers the same content as our face-to-face Personal Stylist Training Course that take place in Hong Kong. The course uses visual and audio learning techniques and combines teaching with continuous interactive tests, self assessments, tasks and case studies. It is an easy learning format broken down into ten concise lessons for confident understanding. Everything you need is at your fingertips. When you register, you have the option to select a personal tutor who will guide you through the course and who is available to answer any questions you may have via email or skype. Your personal tutor will be Eve Roth Lindsay, an experienced trainer as well as an experienced personal stylist. She will guide and help you through your studies. Our International e-learning tutoring includes learning how to work with people in Asia. We are passionate about ensuring our trainees become outstanding personal stylists. If you would like to, you are welcome to discuss the course with our Colour Me Beautiful HK Training Department directly before you sign up. Please click here to contact us. Why not start a new career in 2015 as a personal stylist? You can begin within minutes by clicking here to set up an e-learning account and making a payment. The cost of the International Personal Stylist E-learning Course is USD$1,500 and if you choose to take the course without a personal tutor, then the cost is USD$1,200. You will receive by post a copy of Colour Me Beautiful and the Make-up Manual (by Hamlyn and Colour Me Beautiful) as well as one of each of the six dominant colour swatch palettes (to demonstrate to your clients what colours suit them) These are included in your course price. Payment is handled by PayPal who accept most credit and debit cards. After payment, you will have access to your e-learning Course within seconds. You can study at your own speed, in your own place and at times to suit you. You will have up to six months to complete the training. Apart from our terms and conditions, there is no contract and there are no future obligations. At the end of your e-learning course you will receive a certificate that you will be proud to display in your home or studio. If you have any further questions about this e-learning course please visit our Frequently Asked Questions or ﻿contact our Training Department﻿. If you have questions about any other aspect of our training courses, please use the same contact details. Click this link to create your e-learning account and access our payment facility. You can begin your training for a new career within minutes.